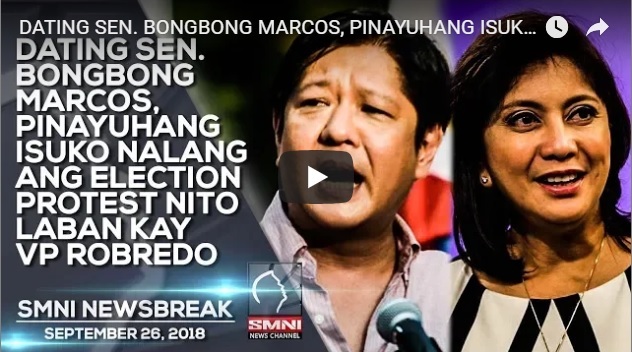 The camp of former Senator Bongbong Marcos reveals that the soft copy of ballots they presented as proof of supposed election fraud in 2016 came from the Presidential Electoral Tribunal (PET) itself. 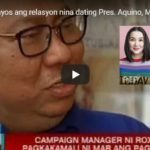 Lawyer Vic Rodriguez, a spokesperson of Marcos, made the claim in a statement denying Vice President Leni Robredo camp’s accusation that the evidence was “fake and fabricated.” “Her accusation though is tantamount to dishonoring the PET because it is the source of the soft copies of all the ballot images we presented,” Rodriguez said. The poll cheating battle becomes the tandem of Comelec and Smartmatic versus TanDem (Tanggulang Demokrasya). Lawyer Glenn Chong of TanDem reinforces the revelations made by Senate President Vicente Sotto 3rd in his privilege speeches last March 6 and 14, 2018. Sotto exposes the irregularities in the 2016 national and local elections. This includes the existence of queueing servers, early transmission of votes, and foreign remote access to the election servers. He claims that his source provides him with system logs that show these anomalies. These data happen to be from the PET. Former Biliran congressman Glenn Chong made a step by step discussion of the system logs in his possession. He compares it point by point with Sotto’s revelations. In the end, Chong proves that Sotto’s exposé is consistent with the entries in the system logs. Of course, Comelec and Smartmatic would not admit any errors on their part – just like what Atienza said beforehand. The alleged early transmission of votes and the existence of secret servers are all set aside by the poll body. Chong asserts that 459 transmissions from the municipality of Ragay, Camarines Norte were made on the early morning of May 8. This is only a day before the 2016 elections. However, as shown on the logs, and as per the Comelec, no vote-counting machines from Ragay were working on May 8. So, the big question now is who sent the transmissions early on that day? Senator Franklin Drilon was quick to ask Chong where he got his data. Well, to the surprise of the senators, the system logs came from Comelec itself. It turned out that the Senate Electoral Tribunal (SET), in the election protest case of Francis Tolentino v. Leila de Lima, had subpoenaed those logs and Comelec had submitted them to the SET. 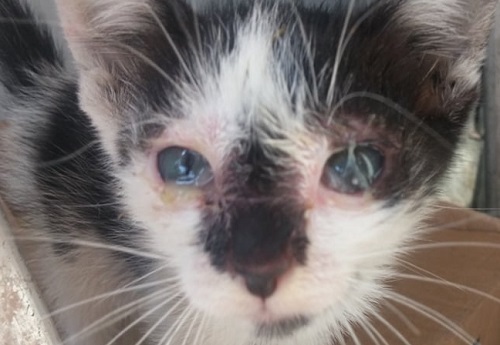 Chong then accesses them through a PET session. 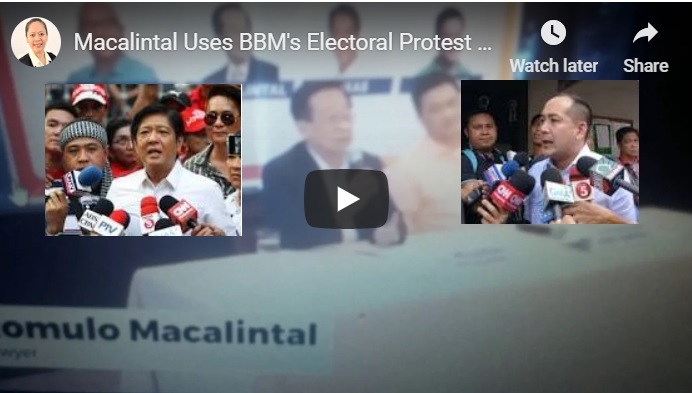 [VIDEO]: Bongbong Marcos’ lawyer said that he pity Macalintal for his desperate media mileage quest using BBM’s protest. The Supreme Court that acts as the Presidential Electoral Tribunal recently said that the ballot recount is nearing its end – except for a few damaged ballots. The recount will continue on January 28 using the decrypted ballots for the unreadable ones. PET notes that the recounts in four protests it previously administered did not reach completion. Marcos’ poll protest would be the first that will eventually be completed, it said. The tribunal reminds the parties repeatedly to refrain from commenting on the ongoing process. It cites the sub judice rule. The recount began last April in Camarines Sur, Iloilo and Negros Oriental. These are the pilot provinces that Marcos identified in his protest. The results of the recount in the three provinces would determine if the tribunal should continue checking ballots. The recount for the rest of the clustered precincts in the country could follow if there’s a substantial basis for the discrepancies in the said initial places. Macalintal holds a joint press conference with former Rep. Erin Tañada (Quezon). This is to discuss a supplemental manifestation of Robredo’s that objects Marcos’ petition for a technical examination in the provinces of Lanao del Sur, Basilan and Maguindanao. Aside from the electoral protest, the two also discuss their respective Senate bids and campaign platforms. In December, Marcos made a petition to look into voters records included in an unrelated petition by former Sulu Gov. Abdusakur Tan against ARMM Regional Gov. Mujiv Hataman. Macalintal keeps on comparing Marcos’ protest to the other electoral protests that are incomplete. This is contrary to the PET’s disclosure that in the history of electoral protests, only Marcos’ case reaches this part to the verge of completion. However, the tribunal does not leave a clue on its actual status because of the gag order. If Marcos’ reference for his claim is only the recount results, then it’s over or far out, said Macalintal. As seen in the video, he seems to insinuate that the Protestant’s team is just over acting since no electoral protest won in the past, he added. This is so because the digital count normally matches the recount results, the veteran election lawyer stressed. Nevertheless, this is contrary to Atty. 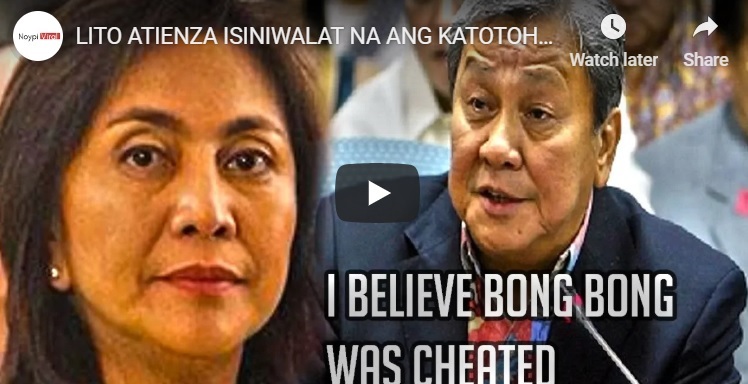 Rodriguez’ feedbacks and the Senate hearing’s election fraud findings in 2016. Does the Congress Insinuates that It also Doubts Robredo’s VP Election Victory? Even the Congress as the National Board of Canvassers that proclaims Leni Robredo as the VP winner in 2016 is in doubt until now if she really wins it. Congressman Vicente Veloso asked; Can we submit this Republic to that uncertainty? 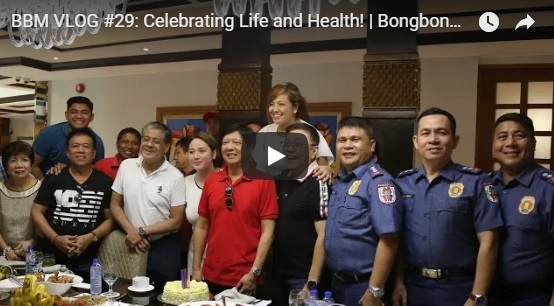 Are we sure that it is Robredo who is the Vice President? The question emerges as lawmakers are rooting VP out in the line of succession. This is contrary to the over-confident advice of Atty. Romulo Macalintal to Bongbong Marcos. He urges the latter to drop his electoral protest. President Du30’s resignation will never happen because Mr. Marcos will never win his electoral protest,” said Robredo’s lead lawyer. However, BBM camp’s spokesperson, Atty. Vic Rodriguez said that Macalintal is under false pretense because why would he urge Marcos on numerous occasions to let go of the protest if they are not guilty of digital fraud? ‘Since when did a pending election protest become the basis of succession to the highest position of the land?’ asks Robredo’s election lawyer. He is also running for Senator in the 2018 Midterm elections. On his election bid, he says that he will push for the rights of senior citizens and persons with disabilities. Robredo’s team expresses confidence in the face of Malacañang’s statement that President Du30 will step down if the former senator wins his poll protest against her. Du30’s resignation will never happen because Marcos will never win his electoral protest, said Macalintal. 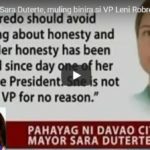 The President thinks that the former Senator is one of the better-qualified leaders to succeed him and if there’s development and he will win the protest and he becomes vice president, yes he will make true to his word,” presidential spokesperson Harry Roque told reporters earlier before his rumored resignation as the Presidential spokesperson. Macalintal criticizes Du30 saying that he’s willing to step down except that he does not think if the constitutional successor is qualified. Marcos’ election protest is currently at the manual ballot recount stage. It covers over 5,000 clustered precincts from his three chosen pilot provinces: Camarines Sur, Iloilo, and Negros Oriental. The results of this recount will determine whether or not Marcos’ protest will proceed with the rest of the 31,047 contested clustered precincts. Senate President Vicente Sotto III, Senate President Pro-Tempore Ralph Recto, and Minority Leader Franklin Drilon all said there’s no time to discuss the charter change. Arroyo’s proposal has no counterpart in the Senate. A resolution calling for a separate voting of a Constituent Assembly is still pending. It has no counterpart in the House. Drilon said that before going into the details of the revisions, the Congress has to decide first whether or not to amend the Constitution and which mode to do it. Atty. Glenn Chong, former Congressman of Biliran Island appeared before a Senate investigating committee on the 2016 Automated Elections. It revived many questions raised for all the automated elections ever held in this country since 2010. This includes the 2016 elections, of course. 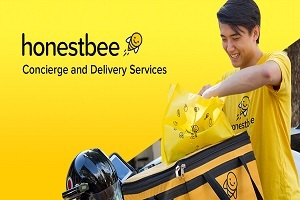 Right now many people are questioning the same issues in the social media network. But with the 2019 mid-term elections getting nearer and nearer, it is high time for Filipinos to exert efforts in driving Smartmatic out of the country. Atty. 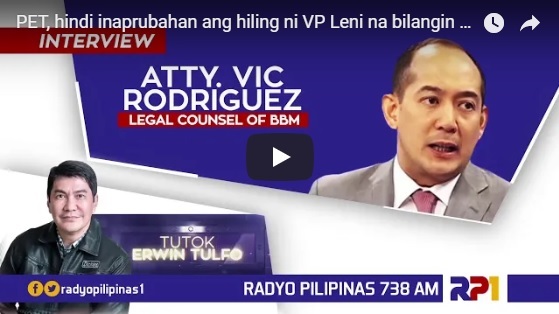 Vic Rodriguez, the lawyer, and spokesperson of Bongbong Marcos directly blasts the presumptive Vice President Leni Robredo on her Supreme Court fake news. This is on the alleged 25% threshold approval for the election recount. Atty. Rodriguez clarifies that the PET resolution dictates that it has no basis to change its 50% ruling. He added that he cannot figure out where the troubled VP gets the thick face to announce such fakes news in a press conference that even international media like CNN falls victim to. Atty. Rodriguez added that they would welcome any move by the PET, motu proprio (on its own), to clarify its earlier resolution on the controversy over its recent resolution on the threshold controversy. 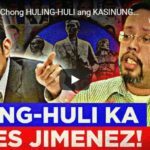 “As far as we are concerned, it is the body of the resolution in its entirety, which should be controlling and not one mere phrase,” Rodriguez said, noting that the PET had clearly set out why it adopted the 50-percent shading threshold after the Commission on Elections (Comelec) only belatedly informed the PET that as a policy they counted votes with as at least 25-percent shading. In a 21-page decision dated Sept. 18, the PET, through Associate Justice Alfredo Benjamin Caguioa, partially granted the motion filed by the camp of Vice President Leni Robredo asking to set aside its earlier decision upholding the 50-percent threshold over the 25-percent threshold, which she said was used by the Comelec during the 2016 elections. The matter involved conflicting views on how much partial shading of a circle beside a candidate’s name in the ballot is sufficient to be counted as a vote for the said candidate in the election protest for the vice presidential race in the last elections. The lawyer also criticized the preemptive acts of opposing counsels in claiming that the resolution was in their favor. This time, she cannot deny spreading fake news because her media allies quickly spread the information given like wildfire. Even other international media like CNN picked the fake news also. Rodriguez already corrected some of them for the wrong headline. It should be; PET upholds Marcos’ Plea and not the other way around. The Marcos Camp, however, presses their opposition to the Presidential Electoral Tribunal’s (PET) use of decrypted ballot images. Plus the tribunal’s insistence on reverting to electronically-generated election returns. This pertains to the ongoing election protest over the alleged massive cheating in the 2016 vice presidential polls in Camarines.